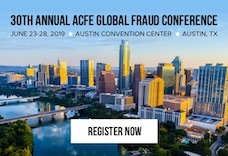 In her 2019 ACFE Fraud Conference Europe session titled “Dos and Don’ts in Investigations,” Cindy Hofmann provided attendees with practical explanations of how fraud examiners should prepare for an investigation. With a calm, measured way of speaking, Hofmann methodically worked through each consideration a fraud examiner should make before, during and after an investigation. Most anti-fraud professionals who have been in the industry for awhile have at least one case that they will always remember as being the most difficult. The investigator may have faced roadblocks in the form of not having any whistleblowers or tips to go on. The case may have been especially challenging because the victim organization refused to disclose necessary information in order to conduct the investigation. However, it’s unlikely that many fraud examiners have had to face the difficulties inherently present in investigating fraud in an active combat zone. Whether it’s a local grocery store, a national restaurant chain or international airlines, loyalty programs have become an ingrained part of modern consumer life. While providing your name and email when making a purchase may seem like a harmless extra step to add, loyalty programs are becoming increasingly valuable sources for fraud.